, properly Claude Gele'I;, an inimitable landscape painter, was born at Lorraine in 1600, and served an apprenticeship to the trade of a pastry-cook. 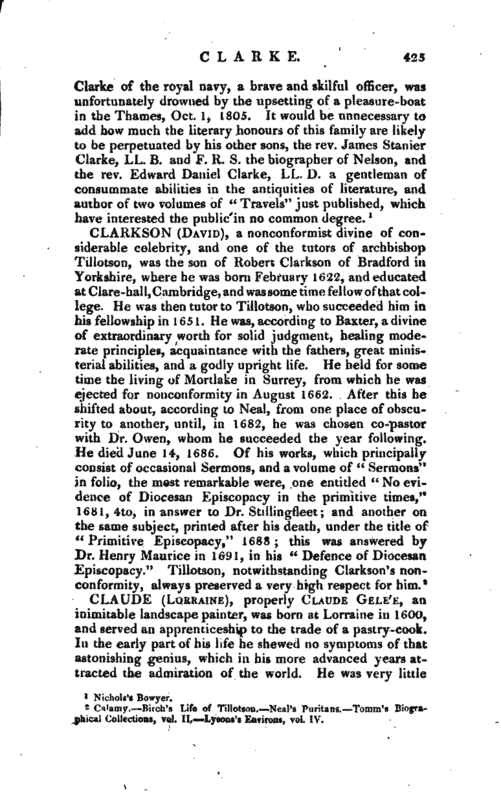 In the early part of his life he shewed no symptoms of- that astonishing genius, which in his more advanced years attracted the admiration of the world. 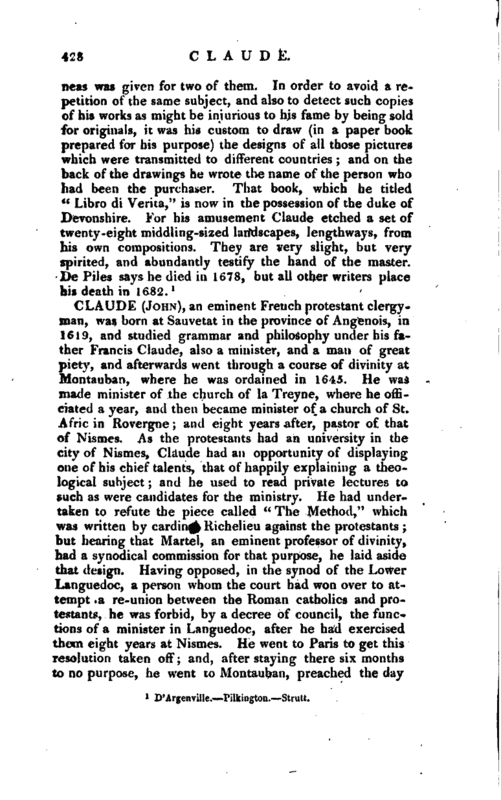 He was very little | indebted to any master for instruction, except Agostino Tassi, who had been a disciple of Paul Bril, and with great labour taught Claude some of the rules of perspective, and the method of preparing his colours. 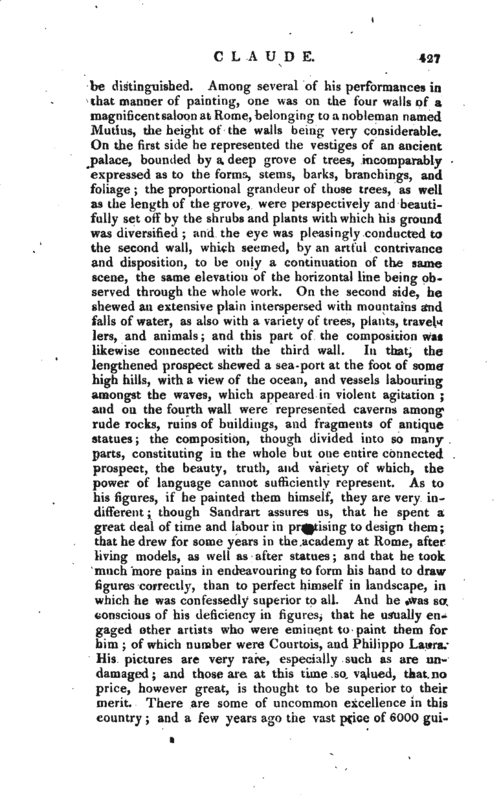 But although at first be could with difficulty comprehend the rudiments y of the art, yet in the progress of his instructions his rnind seemed to expand; his ideas improved; his imagination became more lively; and with wonderful eagerness he applied himself to his studies. During these he explored the true principles of painting, by an incessant examination of nature, usually studying in the open fields, where he very frequently continued frofn sun-rise till the dusk of the evening. There he sketched whatever he thought beautiful or striking; and every curious tinge of light, on all kinds of objects, he marked in his sketches with a similar colour; from which he gave his landscapes such an appearance of nature and truth, as has rarely been discovered in any artist that ever painted in that style. 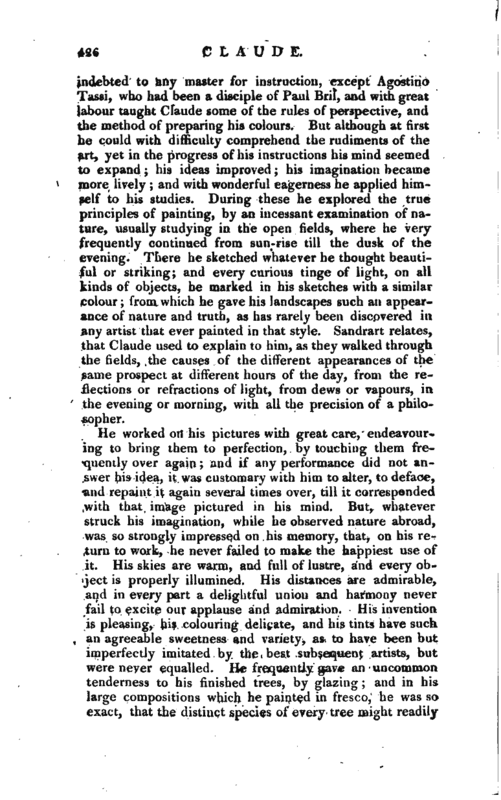 Sandrart relates, that Claude used to explain to him, as they walked through the fields, the causes of the different appearances of the same prospect at different hours of the day, from the reflections or refractions of light, from dews or vapours, in the evening or morning, with all the precision of a philosopher.